Spectacular satellite images suggest that Mars was warm enough to sustain lakes three billion years ago, a period that was previously thought to be too cold and arid to sustain water on the surface, according to research published in the journal Geology. Earlier research had suggested that Mars had a warm and wet early history but that between 4 billion and 3.8 billion years ago, before the Hesperian Epoch, the planet lost most of its atmosphere and became cold and dry. 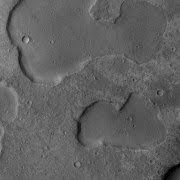 In the new study, the researchers analysed detailed images from NASA’s Mars Reconnaissance Orbiter, which is currently circling the red planet, and concluded that there were later episodes where Mars experienced warm and wet periods. The researchers say that there may have been increased volcanic activity, meteorite impacts or shifts in Mars’ orbit during this period to warm Mars’ atmosphere enough to melt the ice. This would have created gases that thickened the atmosphere for a temporary period, trapping more sunlight and making it warm enough for liquid water to be sustained.